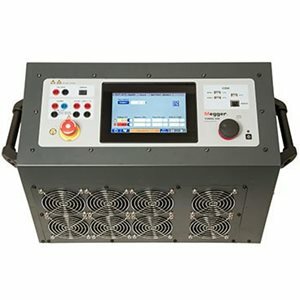 The TORKEL 900 is the fourth generation in the series of Megger’s trusted battery discharge test systems. Discharge testing is the only test method that provides a comprehensive insight into battery capacity, and is therefore an essential part of vigorous battery maintenance programmes. Tests can be conducted at constant current, constant power, constant resistance or in accordance with a pre-selected load profile. Together with the cell voltage logger, BVM, now connected directly to the TORKEL 900, it becomes a complete stand-alone discharge test system. The TORKEL is connected to the battery, the discharge current and the alarm levels (voltage, capacity, time) are set. After starting the discharge TORKEL keeps the current constant at the preset level. When the voltage drops to a level slightly above the final voltage, TORKEL issues an alarm. If the voltage drops so low that there is a risk for deep discharging the battery, TORKEL shuts down the test. All values are stored in TORKEL and can easily be transferred via an USB-stick to a PC for evaluation. Testing can be carried out without disconnecting the battery from the equipment it serves. Via a DC clamp-on ammeter, TORKEL measures total battery current while regulating it at a constant level. Furthermore, the high discharge capacity of TORKEL gives the opportunity to shorten the test time. Discharging can take place at up to 220 A, and if higher current is needed, two or more TORKEL units or extra load units, TXL, can be linked together.